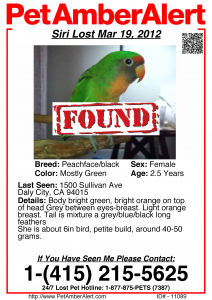 Amazing Lost Bird Success Story! Watch out for Lost Pet Scams! 1. If you must place an ad, include only essential information. Refrain from providing information about unique markings or physical attributes. 2. If you get a call from someone who claims to be out-of-state, ask them for a phone number where you can call them back. 3. If a caller claims to have your pet in their possession, ask them to describe something about the pet that wouldn’t be visible in pictures which may have been posted. 4. Never wire money to anyone you don’t know. Many pet owners have also had their pets microchipped, as this preventive measure has proven to be effective in bringing lost pets home. The missing cat got loose in the airline baggage center at JFK on Aug. 25, after Karen Pasco checked Jack and another cat in as cargo. A day later, parts of the airport were shut down in preparation for Tropical Storm Irene. 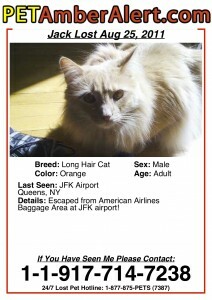 Since then, more than 16,000 Facebook fans of Jack the Cat is Lost in AA Baggage at JFK have been following search efforts that have included at least two Jack the Cat Awareness days, a PetAmberAlert and the hiring of a pet detective. Has your treasured feline joined the ranks of missing and lost pets in Phoenix, Arizona? Acting quickly is imperative and you are ready with your search plan – whom to contact, flyers ready to post, registering on lost pet notification websites, like PetAmberAlert.com can all help in the safe recovery of your missing cat. It might be helpful to also follow your cat’s escape route, review lost cat behavior, and learn the Probabilities Categories of recovering your lost cat. First, ask neighbors for permission to enter their yards to search for your cat. Assess the escape point: did your cat escape through a door or a hole in a window or door screen? This will be the starting point of your search. Think Cat: your indoor cat is probably frightened to find itself at large outside. Unless something happens to startle it into flight, it will follow a path along the side of the house. Search for potential hiding places close to the house: look up, down, left, and right of the escape point for the first structure that might be a hiding place. It could be a deck, storage area, an open garage, access to open area under the house. Place a humane trap in the area near the point of escape. You can also set out a plate of food and position a wildlife camera to film any potential sightings if your cat is making covert searches for food in the vicinity. Cats frequently come out of hiding after dark when the area is more quiet. Search during both day and night hours. If there is good news for missing and lost cats in Phoenix, it is this: 1) a well, sick, or injured cat may likely be within a 5-house radius of home – cats tend to remain within their territory; 2) the chased or startled cat generally remains within a few houses to a few blocks of home. Among the more valuable steps you can take in facilitating your cat’s safe return is to have it microchipped and register the chip with the issuing organization. 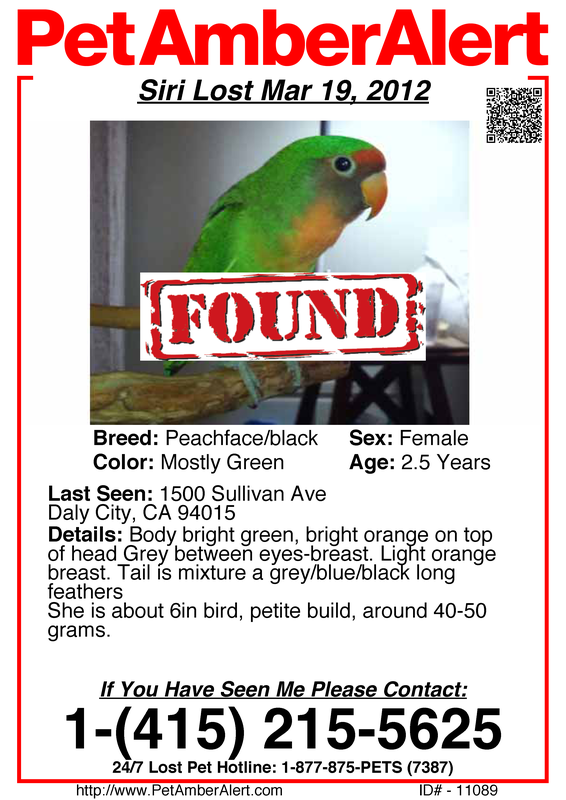 Registering with a service like PetAmberAlert.com is another way of circulating lost pet news in a timely fashion. PetAmberAlert..com acts like a telephone tree that broadcasts a lost pet alert to area residents that your cat is missing. If your cat has returned home after being out in hot weather, be sure to check it for signs of dehydration. Offer it small amounts of water at a time, gently cool it (apply a small amount of rubbing alcohol to the fur between its shoulders) to help your cat’s core temperature return to normal, and monitor it for 24 hours to be sure there are no additional side effects of prolonged exposure to heat. If you have any concerns about its post-rambling condition or behavior, contact your veterinarian at once. To recap: Think like your cat and follow its probable post-escape route. Look up, down, left, and right – from the point of escape to identify possible hiding zones. Remember the Eight Probabilities. May you find your treasured feline companion safe and sound – and soon! When you pet becomes lost in the city, it is important that you act quickly. Pet Amber Alert is your one-stop resource in helping with lost and found dogs and cats. After we have put together a comprehensive list of contact information and other identifying characteristics of your pet, we issue an alert that very same day. With our recognizable name and large social media following, we work to ensure that no lost dog in Los Angeles stays that way for long. Lost pets move fast—moving quickly out of your neighborhood to unknown areas that pique their curiosity. We create a professional lost dog poster that we then send via email and fax to animal shelters, pounds, vets, media outlets, animal control, pet stores and other agencies that are inside a 100 mile radius. Using the latest technology, we can contact thousands of your neighbors to alert them of your lost dog. California is full of people willing and eager to help return lost pets to their owners—we let them know of your need. With too many lost dogs in Los Angeles, the animal shelter does lethal injection when its owner cannot be located. However, with Pet Amber Alert, your lost cat or dog is in our database, which means that you have a much better chance of someone recognizing your pet so that it can return safely to your home. PetAmberAlert.com has successfully reunited hundreds of lost pets with their owners, even in huge places like New York City. If you have lost your beloved pet, we can help you put the word out so you won’t be alone in your search. We reach out to your neighbors and all the usual suspects (shelters, pet stores, animal control, etc.) and involve them all with your efforts. Lost pets can move really fast, so you have to act quickly to increase the chances of bringing them home safely. Even in New York, a lost dog could easily wander for miles. Once you submit your information to us, we will immediately send out the phone and poster alerts with photos, descriptions, and any other relevant details to make sure that people will recognize your dogs or cats and know exactly who to contact. The process is simple. We will gather the necessary information about you and your missing pets and use it to create and send an effective poster to shelters and other pet-related businesses. The phone alert will also go out with your personalized, recorded message. Within minutes, hundreds or even thousands of people will know about your missing cat or dog, and you will have a much better chance to get your beloved animals back safe and sound.